As I’m sure you’ve realized by now, dogs and animals mean a lot to me and are a huge part of my world. If you haven’t already, click here to meet my personal herd! Because of that, I’m often asked about the groups or organizations that I recommend, so I’ve compiled a list for easy reference. This is a living post, meaning that I’ll continue to add and update, as often as I need to. This list includes local, national, and global organizations. 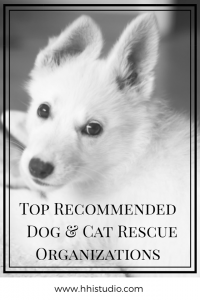 And, without further ado, here are my top rescue organizations to support! The R+FP is a US based non-profit organization dedicated to rescuing survivors of unique captivity and cruelty and telling their emotionally compelling stories to prompt social change and celebrate a #RescueLifestyle. 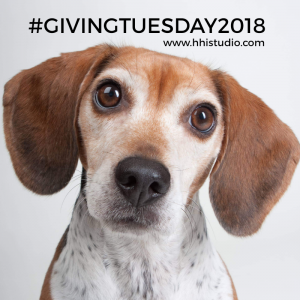 Since 2010 the charity has been freeing survivors from laboratory experiments, senior and special needs animals from shelters, and victims of horrific abuse from around the world. No matter what the condition, the location, or the expense, the Rescue and Freedom Project stands at the ready to rescue, rehabilitate, and repeat. Several years ago, my best friend brought this organization to my radar. 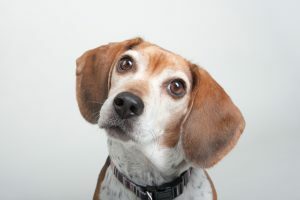 We had our first beagle, and I was learning about the horrors associated with beagles and testing laboratories. Since learning about Rescue + Freedom Project, I have made it a mission to educate my friends and family, and make choices every day to support cruelty free products and companies. Much of my education has come from this organization, and I applaud their efforts and am proud to watch them grow on a global scale. 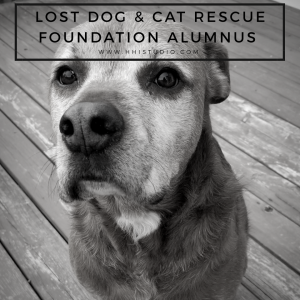 The LDCRF helps homeless pets find their way into loving homes through rescue and adoption. We offer same-day adoptions and two-week trial periods. ALL pets are spayed or neutered prior to adoption. Over 30,000 lives saved since 2001. Pebbles was adopted from LDCRF in July 2012! This organization has a huge place in my heart because two of our herd came from them. The first adoption was Pebbles, July 2012. And then a few years later, Maggie 2. They have a huge following in the area, too, and it’s obvious why. 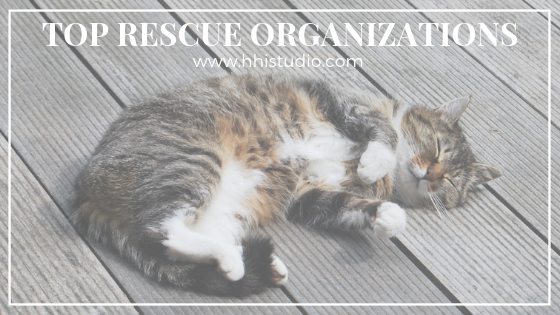 Our family highly recommends this organization! Fun fact, before I adopted Pebbles, I purchased a tee shirt as a fundraiser for this group. I didn’t even realize it had been for LDCRF until several years later when I was cleaning out my closet. That shirt is still proudly hanging in my closet today! 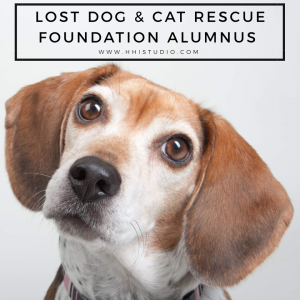 Maggie 2 was also an alumnus of LDCRF! We are a “dog-centric” all volunteer rescue organization that provides pet adoption in VA, MD & DC. 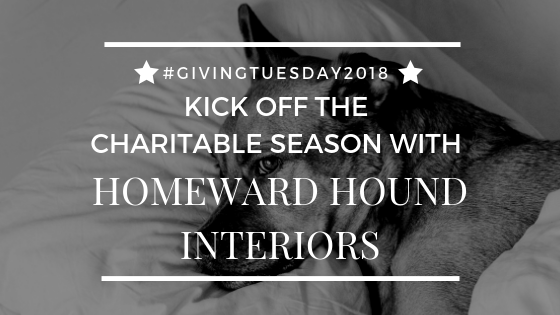 While none of our pups came from this organization, we strongly feel that Pebbles brought DWR into our life for good reason. 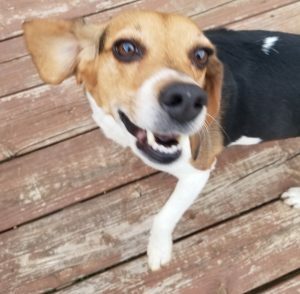 During late spring, they had a beagle that looked and acted so much like Pebbles. We met her and unfortunately she wasn’t a good fit for the house or herd, but by the end of the summer she did find her forever home with her foster family. When DWR says they care about their animals, they truly mean it. We met the organization’s leader during that meet up, and I was beyond impressed by her. I’ve stayed following her and the rescue ever since then, and I can see how much she loves and cares for every single dog and family she brings together. I’m definitely glad Pebbles brought DWR to our attention! Make sure to check in on this blog post occasionally to see if we’ve added any additional organizations! And if you’ve got a dog and/or cat rescue or organization you’d like us to be aware of, let us know in the comments! This is a living list, meaning that I’ll continue to update with additional groups and organizations, as I find them. If you told me I’d have a dog live past 15, I would have raised my eyebrows. Over 18? I would have laughed! But we’re already at 18 – 3/4 years with Maggie, so that’s actually become a reality for us! 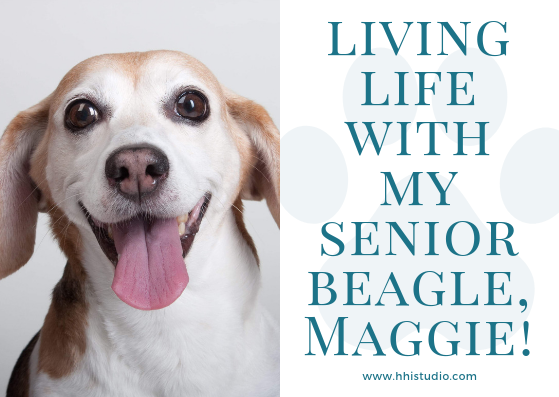 It’s a daily blessing to have our Senior Beagle, Maggie (aka old lady, mags) in our life. Our senior, Maggie! Living with a senior dog past 15 has been quite educational. If you are a reader of the blog, you may recognize the picture and Maggie’s name from the earlier post here. She was 13, fast approaching 14, when she came to us. Sadly, her human mom had died 10 months earlier in January of that year, and then her human grandmother died in July that same year. Unfortunately, her other human family members couldn’t keep her and started looking for someone to take her. At that time, we were still a 1 dog household. However, we had been thinking of getting another dog for Pebbles. Mags fit right in with the family and Pebbles became her caretaker and best friend, immediately. 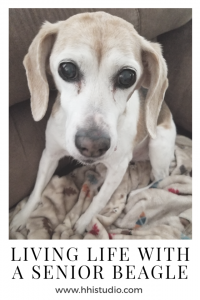 Caring for a senior beagle (or any senior dog) can be a struggle, as well as very rewarding. And over the last 5 years, especially within the last year, I’ve learned a lot. We had never had a dog live past 15 before, so this is new territory! 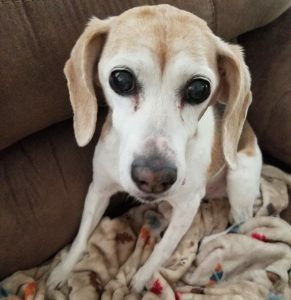 In this post, I’ve pulled together a few thoughts and tips I’ve learned from raising this senior beagle and wanted to share. What they put in their bodies is just as important as it is for us. We use a combination of brands and canned veggies to give balance and variety for Mags. This has changed, especially in the last year as she has lost teeth and can’t chew the dried nuggets anymore. Maggie eats canned dog food made from real food. It honestly looks like something we (humans) could or would eat right from the can. We also add in some pumpkin to regulate her digestive system. And have recently started adding oatmeal and freeze dried meat patties. We mix everything all together with some water. She gobbles it right up! In fact, her internal clock tells us when it’s meal time. She sleeps 20-22 hours a day, most days. When she is up, it’s very obvious she isn’t the same as she was even a year ago. Part of that I blame on the very sudden loss of her dog caretaker, Pebbles, in August 2017. But also, and obviously, it’s due to her age. We try our best to keep watch over her so she doesn’t hurt herself. She is also rather stubborn, and a creature of habit, so we’ve had to make some changes, which took time for her to adjust to. Example: she no longer is trusted with going up or down stairs by herself. Or jumping on or off furniture. She pushes that stubbornness often, though. Giving us heart palpitations on the regular. thought 3: Don’t veer off her schedule, much, or at all! Her internal schedule dictates EVERYTHING. We have very little flex room from her regular schedule. What little room we have, if that gets stretched too far, it can take days to regulate her body back to normal. And, it can mean long nights for everyone. As I’ve mentioned with her schedule, the bathroom visits are just as critical. We are almost back to that puppy stage. Where you take them out ASAP after naps, meals, night, etc. And making sure she actually does her business is also important! Often, she forgets why we are out there, and tries to head back inside without doing anything. Sometimes, we are lucky to automatically know if something happens to us that our furbabies will be taken care of. But that’s not always a given. So this last tip is a reminder: make sure you have an action plan for them if something happens to you. Senior dogs are the ones most likely to end up in shelters, and they often don’t get adopted. Folks looking for animals to adopt typically aren’t wanting an older animal, for whatever their reasons. Make sure your furbaby doesn’t get forgotten. Have a plan for them, too. I swear this girl has 9 lives with near death scares she’s given us over the years! I’m so glad she’s held strong and stayed with the family this long. She’s pretty easy going and goes with the flow of the other dogs. But, I know she’ll take a large chunk of my heart when she passes. People have said we are special people for having adopted a senior dog, but I don’t see it that way. Maggie fit perfectly into this family pretty much the first minute we saw her. Maggie’s been with us for 5 years now, and it’s an honor to have had her in our life this long. While I know her time with us isn’t probably much longer, I will continue to cherish the time we have with her and continue to learn how to care for seniors. 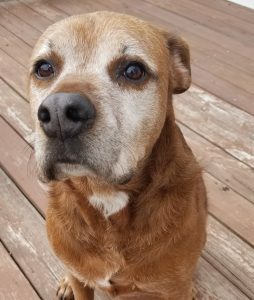 Here are my top 5 thoughts and tips on living with a senior dog. Would I adopt a senior again? Absolutely. In fact, I have a dream to someday open a pet sanctuary, where I will adopt senior dogs for their forever homes. Senior dogs deserve to live out their life with love and family surrounding them. And that’s my goal. One dog at a time. One senior at a time. 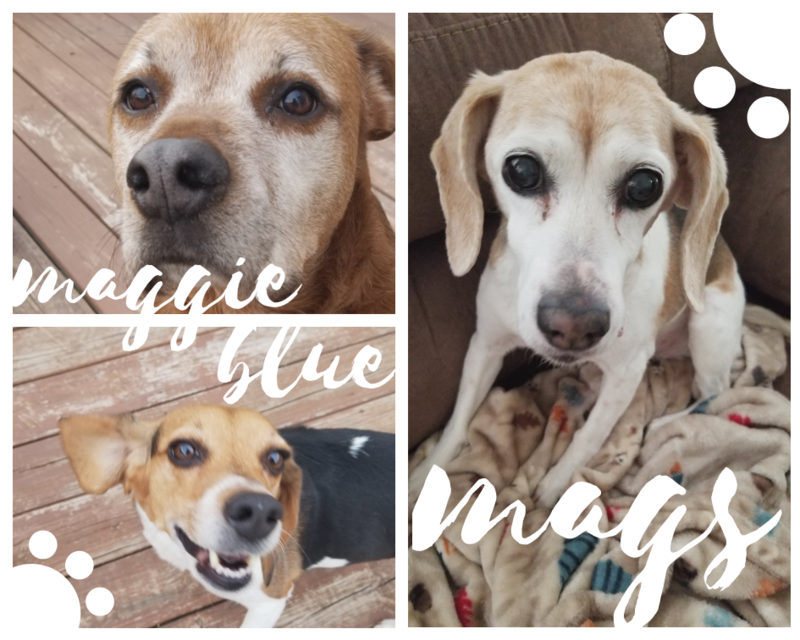 Meet the Hounds in My Life! 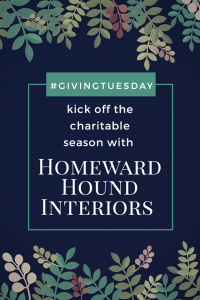 As I’m sure many of you are wondering, how and why did I end up naming my business HHI Studio (aka Homeward Hound Interiors)? 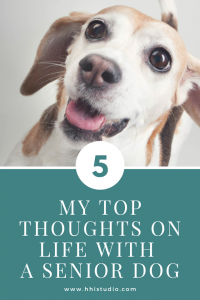 The answer is relatively easy…my love for dogs, especially my dogs, sparked the need for a name for my firm that would incorporate my furbabies. Before I introduce the 3 pups in my life right now, I want to take a moment to spotlight and remember my sweet angel girl, Pebbles. She was taken from us way too soon in August of 2017. Pebbles was in my life for many career and personal struggles and celebrations. She was the first dog that was truly mine, not just a family dog. She helped me get through so much and I thank her for the years she gave me. I still miss her every day. She’s the angel with paws watching over me. The oldest of my herd is Maggie (aka Mags or Old Lady). She’s 19 years old and still going strong. She loves to sleep, but lives for breakfast and dinner (and second dinner). Mags is such a sweet girl! We adopted her when she was 13, but it seems like we’ve had her forever because she fits in with our herd so well.